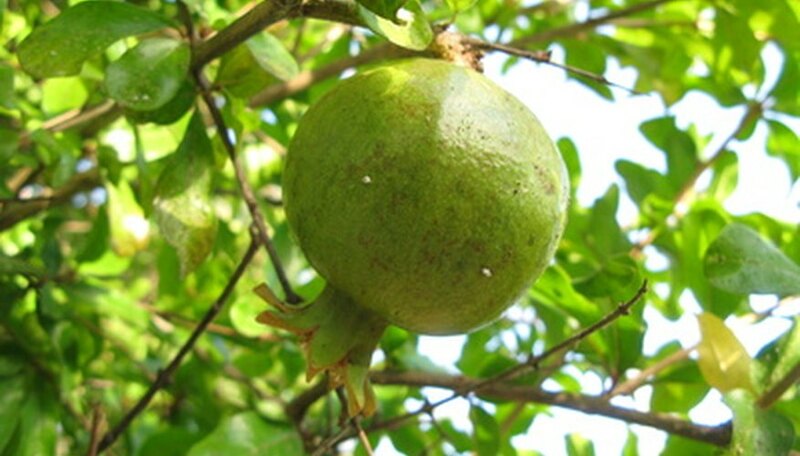 The pomegranate tree is a deciduous fruit-producing shrub that is native to Asia and areas in southeastern Europe. The shrub reaches a height up to 12 feet, but is trainable to form the shape of a small tree. Pomegranate trees are hardy to plant in USDA growing zones 7 through 10 with varieties that can withstand temperatures down to 10 degrees Fahrenheit. The trees produce fruit in the third year of growth and stay productive for up to 15 years. Select a planting area that has a slightly acidic, well-draining soil and full sunlight for the pomegranate tree. The warmest area in a home garden or landscape is ideal for the tree. Test the soil pH to verify it is 5.5 to 7.0. Work ground rock sulfur to a depth of 8 to 10 inches to lower the pH number or limestone to raise the pH number. Apply a generous amount of water to assist with absorption and let the soil rest two weeks. Dig a planting hole for the pomegranate tree that is twice as wide as the root ball and the same depth. Set the root ball into the hole, making sure the top of the root ball is even with the ground level. Mix organic compost into the removed soil and pack it around the root ball. Water the pomegranate tree after planting to an absorption level of 10 inches. Continue to water the tree each day for the first two weeks of growth. Provide supplemental water to the tree each week during the hot summer months to stimulate fruit production. Fertilize pomegranate trees with an 8-8-8 fertilizer after the roots establish in the second growing season. Apply two pounds of fertilizer to young pomegranate trees and four pounds to mature trees in early spring and again in late fall. Prune the pomegranate tree stem to a height of 1 foot with four to five evenly spaced branches remaining after the tree reaches 2 feet in height. This will train the tree to form strong branches and a desired shape. Prune sucker growth that appears at the base of the tree trunk. Increase branch growth by shortening stem shoots each spring for the first three years of growth. Heavy pruning is not required after three years of growth.